Happily at work in La Potenciana, Costa Rica. There are things that draw us in. There are places that we like to go and things we like to do just because we feel pulled to them. Everyone is different in their affinities, but we all have them. We all have things that just seem to fit us, things that, when we do them, make sense on some fundamental level. We spend a lot of time doing things that we have to do, things that we are not necessarily inclined to do, but which are necessary for our survival. I don’t have a particular affinity for cooking, but I do it when I have to. I doubt many people have affinities for scrubbing down the bathroom, but we do it because it needs to be done. Unfortunately, we are all too often not able to discover affinities we might have. We have to pay rent and do the laundry and we end up not having much time to find out what draws us in. We tuck our affinities into corners of our days however we can, because when there is something that we are drawn to, there is no way we can escape the magnetic tug. A singers will sing, even if it’s just in the shower or under her breath on the 2 train. Some people have to wriggle their affinities into the fringes of their days, working jobs that have little to do with what they love. Other people are lucky enough to have jobs that directly correspond to their affinities, jobs that mesh with the places and activities to which they are most inclined. Growing things is difficult, and one of its greatest difficulties is the risk it carries. When you work with soil and seeds you rely on factors far beyond your control, factors that you can’t hope to influence with any amount of effort or investment. All kinds of weather patterns and natural phenomenon directly affect your bottom line as much as human phenomenon like consumer whim on the other side of the world. If growing coffee is so difficult that someone who calculates the viability of choices for a (very well paid) living literally scoffs at the idea of planting it, then why do people do it? Why in the world dedicate yourself to something that will never stop being inherently belly-up vulnerable? Growing coffee only makes sense if you have an affinity for it. Coffeepeople echoed to me again and again the way they just like growing coffee. There is something about working the land and seeing the bright red and yellow of ripe cherries framed against the rich green of the shiny leaves that just inspires a pride and satisfaction that somehow makes all the risk and raw vulnerability worth it. Not everyone lasts in coffee; there are plenty of people who grow coffee when the price is right and then rip it up and plant bananas when that price is better. But there are also ranks of people born into coffee lands who have a deep and true affinity for its cultivation. It was this magnetic love for coffee growing, albeit an illogical one by many external evaluations, that I observed over and over as I traveled from one coffeeplace to another. We can all learn to do things that then become ingrained in the fibers of who we are, but being able to live your affinity day after day is a powerful luxury that is often hard to recognize. As I saw affinities emerging all around me, I also discovered some of my own. When I tell people about my coffee odyssey, they often comment, “Oh, you must really love coffee.” When I started it I didn’t. I like hot, bitter, black coffee the same way any addict loves a drug, but I didn’t swoon over single origin espressos or perfect hand-brewed pour overs. I drank whatever cheap coffee was available at the corner deli and was happy with everything about it. I embarked on my odyssey not because of any particular affinity to coffee but because I saw a hole in consumer knowledge. It frustrated me that people were waiting in line at NYC farmers’ markets to buy organic veggies and grass fed beef but were still unquestioningly sucking down Starbucks the whole time. How could something so integral to our daily lives skirt the scrutiny to which we were subjecting our food? When I started the on the ground research for the book I had no particular affinity for coffee. I was doing this because I knew of many successful books about food sourcing, and since there was none about the detailed realities of where our coffee today comes from, I thought I might as well be the one to literally write the book on the nitty-gritty behind coffee, subjecting it to scrutiny and assuming that all the coffee addicts of the world would be curious enough as to the source of their drug to some day read the result. My choice to pursue coffee was based in market research and food sourcing literature/consumer trends/interests. Affinity wasn’t part of the equation. I guess I got lucky, because as soon as I first set foot in a cafetal, I felt like I was where I belonged. I grew up in the stony, snowy mountains of New Hampshire, where our forests are filled with towering pines and oaks and maples that shed their vibrant feathers each fall. The only times I’d been anywhere remotely tropical were a 5th grade family vacation to Disney world and a week long trip to rebuild a hurricane damaged house in Florida during high school. I had no experience with tropical agriculture or flora and no reason to feel at home in the soggy Costa Rican jungle, but I did. I felt an instant comfort and peace the first time I stepped into a coffee forest, and my affinity has only grown since. There are some large coffee farms that are run more like farms, with rows of coffee trees cooking in the sun, and those feel like pretty soulless agricultural enterprises. But the less industrial cafetales, the ones planted and maintained by people with deep affinities for what they do, inspire a sort of zen that I’ve yet to encounter anywhere else. It might have to do with fact that coffee trees are inherently good looking plants. The waxy green leaves are seductively shiny and camera-ready. The white flowers against the contrast of the dark green leaves are just as striking as branches full of ripe cherries. There is also nothing offensive about a coffee tree to offset it attractiveness. It can grow tall and reach its spindly branches into the arms of other plants, but it doesn’t have razor sharp leaves, spiky seed shells, choking vine tentacles, or any of the other character flaws typical of tropical plants. Coffee seems like a dignified gentleman, and tracts of coffee trees manage to give off the aura of an important forum, one we should be so lucky to be in the presence of. For all my months in the cafetales of Latin America, I’m far from a caficultor, but there is still something about coffee that draws me in. I like the beverage as much as I always have. I’m still perfectly happy with my cheap, burnt deli coffee, but I’ve also learned to appreciate the complexities of a cup of coffee wrought from beans expertly grown, processed, and roasted with the utmost attention to quality. I’ve certainly developed a deeper affinity for the drink, but the real new affinity I found is to the process of growing coffee plants, of watching a seed shed its casing as it germinates, of seeing a seedling sprout new pairs of leaves. Who knew the plant behind the product I (rather arbitrarily) decided to investigate would be so cool. Most of the world’s coffee is grown like the industrial commodity that it so often is, but coffee is malleable, and it can be cultivated by people who have a great affinity for the process of growing it as much as for the final drink. Sometimes coffee cultivated with affinity is sold in micro lots as specialty coffee and carries some of that humanity all the way to the final cup, but sometimes coffee cultivated with affinity gets tossed in with unloved beans. Either way, knowing that coffee is a plant that has enough mysterious charisma to again and again inspire people to tenderly care for it even in the face of slumping prices and dire weather just makes every cup taste a little bit better. Pingback: NYC Baristas Speak: 3 Questions with Park Brannen of Counter Culture | W h e n . C o f f e e . S p e a k s .
Pingback: NYC Roasters Speak: The Willamsburgers | W h e n . C o f f e e . S p e a k s .
Pingback: Intention of Integration | W h e n . C o f f e e . S p e a k s .
Pingback: Coffee in Hand | W h e n . C o f f e e . S p e a k s .
I love this blog post! You hit a chord. It speaks to me personally without the coffee connection, but it also speaks to me with the coffee connection. Even though I am not a coffee grower/producer and I only spent a few hours picking coffee cherries, my few days on the farm/cafetal in Potenciana, Cost Rica, following the pickers and riding to the receiver, then later meeting more coffee people at the SinterCafe Conference, and in listening to/getting to know Mike, Bill, and their adopted community/family in Potenciana, Costa Rica, I know what you are writing about. They are inspiring. For me it was also about picking up on a lost thread of my life from the 1980s when I spent more time in tropical or remote areas of the world. 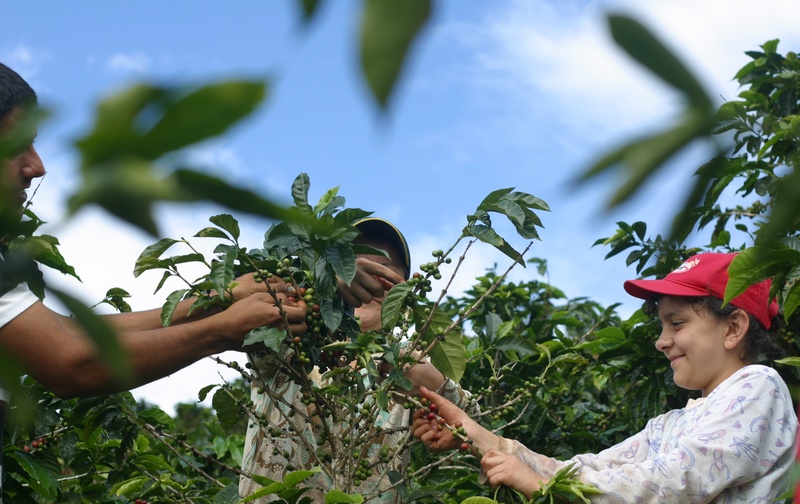 I love the idea that when you talk about coffee, you are often talking about the coffee families and communities, which is a big part of what your journey and book are about. Another awesome post Rachel! Becoming ingrained sneaks up on you in the coffee world. Coffee farms are all in such beautiful locations, there is little wonder why the community residents are the happiest people around. In your photo, Tatiana’s pride as she traded her “chit” for the 1000 colones she earned picking her first cajuela is so evident and so representative of the relationship the communities have with the land. Thanks for your continued coverage!